Homeschooling on Hudson: MIKRO MAKES WORDCOUNT! 2016 NANOWRIMO WINNER! MIKRO MAKES WORDCOUNT! 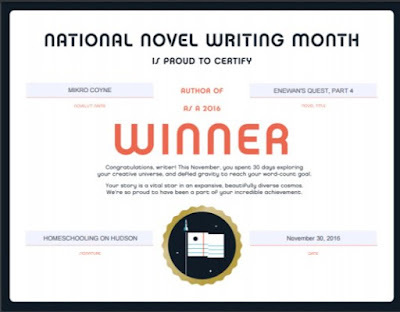 2016 NANOWRIMO WINNER! Mikro is overbooked this semester. While Nanowrimo is a favorite activity here, we didn't even register him till after Thanksgiving, so I set a short wordcount that I thought would be challenging but doable in a couple of days... He did it! With much cajoling and a bit of collaboration (I helped, especially with the songs...), he finished another chapter of Enewan's Quest. You can read the other installments at this link and this link. Copyright 2016, Mikro Coyne. All rights reserved. At sunrise, I met with the rest of my new team. Benaret is unusually tall, like her grandmother Binarim. Although she is fairly young, she is known as a formidable swordswoman. She carries three swords of different length on her back, and daggers in her boots. She seems eager to embark on our quest. Shiran, a stocky older warrior, is known for his stealth and his skill with the Sakarran, a three bladed throwing weapon. Retenotar, the third warrior, is slim and agile, and is known as the best archer in the Netarpa clan. We gathered for breakfast at the Hall of Sedenka, so that my master could help brief us on the journey ahead. “You have all probably noticed that our Home Tree is looking sickly. You are going to help cure it by going on this quest to gather ingredients for a potion from the Realms of the Living, and from the Lower Realm.” Sedenka announced. “Enewan is fated to lead you on this quest. Rotonaka will accompany you and give advice and support,” he continued. “Shaman Sedenka, why is the Kuru Dupal ailing?” asked Shiran. Rotonaka glared, but fell silent. “The rest of you should get ready for our departure,” I ordered, trying to sound confident. “Gather provisions and trade goods, then return here to meet me this evening.” The warriors left immediately, already discussing what to pack. Rotonaka lingered. Rotonaka left, muttering under his breath. “That one is trouble.” Sedenka warned. “But you must forget that for now and concentrate on the task at hand. Join me in the workshop,” he invited. As Tarran I ask now guide me. The wood in my hands began to glow, and as I finished my song it seemed to grow warm. I could feel it changing, reshaping itself, as if it were absorbing the song, and singing it back to me. The smooth surface of the cone now bore the image of the Netarpaxylotyl, a small salamander found throughout Netarpa, which migrates through the jungle during mating season. This is the guide Anazuli sent, whose white and grey hide resembles the bark of Kuru Dupal, and whose green markings are the perfect image of its leaves. It is said that Netalian followed the creature through the jungle until he found its home territory, and the largest, oldest tree therein, the Kuru Dupal, which became our Home Tree. More time had passed than I knew. When we looked outside, dusk had fallen and the team had already gathered. The three warriors sat around a lantern , while Rotonaka paced nervously. Sedenka scowled. “Give the fool a demonstration, boy!” he whispered to me. I pointed my tarran in Rotonaka’s direction and sang the spell for winter ice. A plump snowball appeared over Rotanaka’s head and crashed down on him. “Impudent child!” he snarled, brushing snow out of his fur. “I trust your doubts have been settled,” Sedenka chortled. Benaret and Shiran exchanged a glance, which I could not interpret. Retenotar covered his mouth as if stifling a yawn, but I knew he was trying not to laugh. Rotonaka shook with anger, but he said nothing for a change. I could not help looking back as we boarded the gondolas that would carry us down to the jungle floor. I was leaving everything I had ever known. And I was responsible for the life or death not just of this small band of travelers, but of the Kuru Dupal and all of my clan. Maybe Rotonaka was not so far off. It seemed a lot for someone my age to handle. When we touched down on the soft mossy floor of the jungle, we walked around the Home Tree, looking for a tunnel under the roots. The tunnel led down at a fairly steep angle, and was pierced in places by roots that had grown through it. Near the surface, they were healthy and robust, but as we descended, we noticed that the roots were shrunken and smelled of rot. “Disgusting!” complained Rotonaka, wiping some root slime from his cloak. The odor of rot clung to him. The first clue that we were close was an enormous tube of shed skin lying on the tunnel floor. The size of it was daunting. Even the warriors looked worried. It was clear that the Fire Serpent was no ordinary snake. I decided not to wait any longer. I unwrapped the tarran slung over my shoulder and began to chant. Almost immediately I could see a cloud of my breath in the suddenly frigid tunnel. It had worked. But I had no idea how long it would last. I urged the others onward. Soon the tunnel opened up into a larger chamber. One long main root came down from the center like a large column. Around it twined the monsterous Fire Serpent, which was not a snake at all. It was a lindworm—a wingless dragon with a long serpentine body and two underdeveloped limbs. Benaret wanted to chop its head off while it slumbered in cold induced stupor, but I was not sure what its blood would do to my winter ice. Better to get what we came for and leave before the beast awakened. That proved to be more difficult than I had anticipated. The Winter Ice spell had also frozen the sacred well. Retenotar had to climb down to the water’s level and chip out a cup full of ice. As soon as he climbed back up, we retreated towards the surface. Shiran and I exchanged concerned looks as the roof of the tunnel began to drip. “Make haste!’ I ordered. We began to run. We had just reached the surface when we heard the Fire Serpent roar. My blood ran as cold as the magic ice when I realized how narrowly we had escaped. In the safety of the lower branches of the Home Tree, we poured the sacred water into a bottle and corked it. One ingredient down. Eight to go. Although it was late, we loaded our provisions on a cart and set out into the jungle. We had a lot of ground to cover before reaching the next ingredient. I checked the map to be sure we were heading in the right direction. Shiran drove the team of Skraels. Benaret and Retenotar took turns scouting ahead or watching from the back of the cart for any dangers. Rotonaka lounged atop the baggage and snored loudly. We stopped for the night when it became clear that we could not stay awake much longer. Since he had the benefit of napping along the way, Rotonaka was assigned the first watch. Before I laid down to sleep, I looked at the map one last time. Tomorrow, we would be entering Salanaen territory, in search of the second ingredient: 6 tail feathers from the anora, spectacularly plumed bird that hunts prey. Since Netarpa is on good terms with the Salaneans, I hoped that the only danger we would face would be from the anora. I wrapped the map up and stuffed it in my bedroll before rolling over to sleep.